Christmas, New Year and December in general is a great time to reminisce, and think about the year that was. We’ve been thinking about 2017 and all the great cakes we have made this year, and we decided it would be fun to write a blog post on our favourite and most memorable cakes of 2017! We’ve scrolled right through the archives and picked out a few to share with you – we would love to know what was your favourite cake of ours this year! We ended up nicknaming this cake ‘The Beast‘ at Sweet Bites, as it feeds 540 serves! ‘The Beast’ is named for good reason – it starts at a 4″ and finishes at a 15″ hexagon! This cake was at the Bride & Groom Wedding Show this past May – a memorable cake, indeed! This is one of the coolest lego cakes we’ve ever made! Finley’s awesome lego collection might’ve had something to do with it, too. 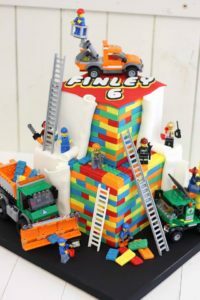 Lego wedding cakes are also becoming quite popular – if that is something you would be interested in, we can make it happen. When gold leaf and orchids come together, they make something beautiful! 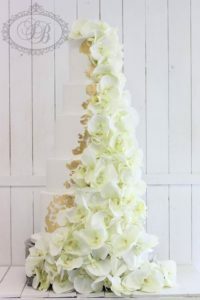 We used 100+ orchids to create this gorgeous cascade. 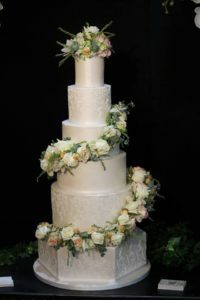 The lovely couple had their wedding at the Langham, a perfect location for a cake like this! We are OBSESSED with Harry Potter, so every time we get a Happy Potter themed order, we get so excited! We think you guys might like Harry Potter just as much as us…. which is why we can’t wait for more Harry Potter orders to come through next year! We love the colour palette we did for Laura’s 30th Birthday! 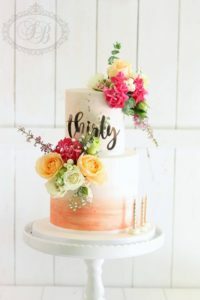 Her cake included fresh flowers, peach watercolour and metallic gold finishes. The topper was from Red Pepper, and blooms from M.A.K Floral Studio – don’t they give the perfect touch! The day we made this was the day we went a bit crazy in the kitchen, but we love how this one turned out! Have you seen a cooler kids cake?! 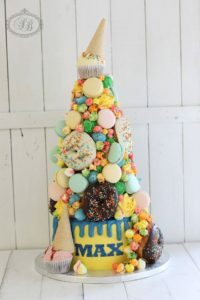 Covered in donuts, cupcakes, candy corn, macarons, buttercream, sprinkles and ice cream cones – we’re drooling even now! Special shout out to Bluebells Cakery who made the donuts, cupcakes and macarons! 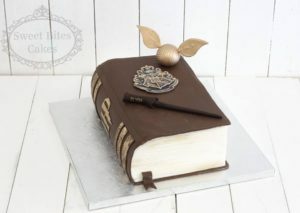 Now this is a 50th birthday cake! 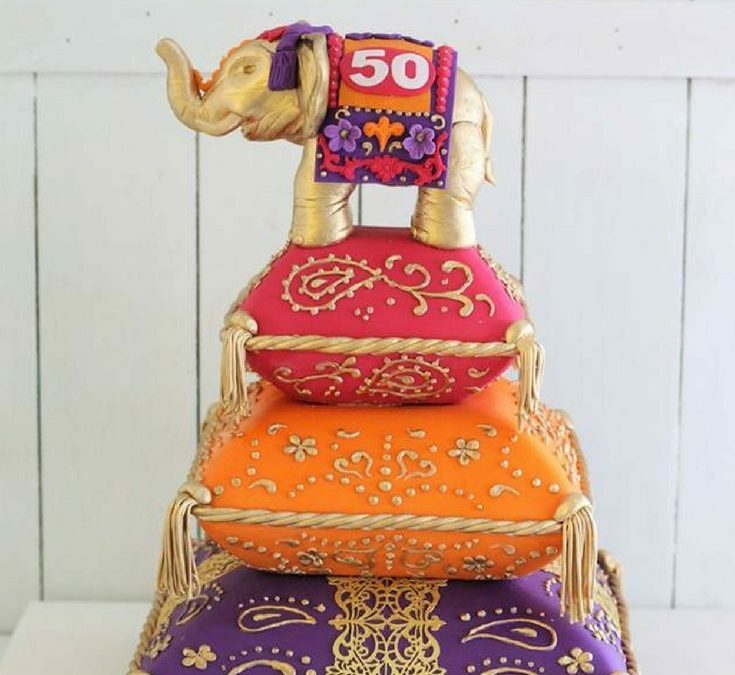 Everything on this cake is edible and handmade, including the beautiful elephant on top! 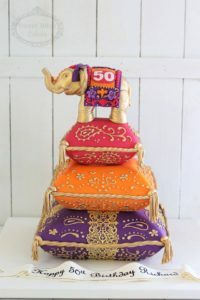 This was definitely one of the more memorable cakes – it was such a fun opportunity to play with such vibrant colour! 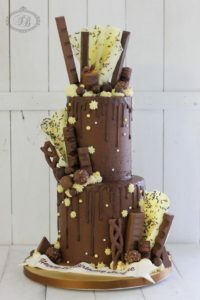 Ferrero’s, Kinder bars, Maltesers, Curly Wurly’s and Toblerone’s along with buttercream and ganache made up this chocoholic’s cake! We remember it smelt so good we wanted to eat it ourselves! Oh my goodness. We can’t even. 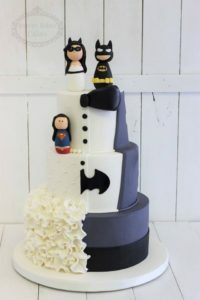 We made one of these super fun Super Hero wedding cakes with an added twist – a little Superwoman to represent their daughter! Such a special addition – we’re not crying, you are! 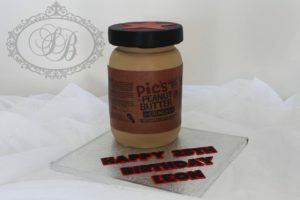 BONUS: If you have followed us for a while you will KNOW we love Pic’s Peanut butter. LOVE THE STUFF. When we were comissioned to make a Pic’s Peanut Butter cake… BEST. DAY. EVER. This is what we came up with! We also wanted to take this opportunity to say thank you so much to everyone who supported us this year! Being able to create wonderful cakes for our customers is a truely a dream come true, we wouldn’t want it any other way. Wishing you the happiest New Years, and look forward to creating and sharing all things cake with you next year!